Customized Trifold Umbrellas, 44 in. Orange, Navy Blue, Pink, Yellow, Light Blue, Lime Green, Black. Lowest cost in USA, Canada. Sturdy customized umbrellas in bulk, in many solid colors. Budget Prices in USA and Canada for wholesale customized umbrellas. The Three Fold Manual is a big 44 in. arc umbrella in a tiny, compact package with an affordable price tag. Imprintable sleeve included, this umbrella is only 9.5 inches long when folded, so it can be easily carried and tucked away until needed. Matching sleeve with convenient carrying handles. Light aluminum shaft and frame. Colored plastic grip handle. Eight (8) panel umbrella. Fiberglass support ribs. Velcro closure tie band. Manual opening. We also supply blank (not personalized) 44" umbrellas at EQP (End Quantity Price). Free artwork design. We will send you a proof for your approval before production. American clients pay no taxes. Unit Prices below include your 1-color custom imprint on one panel. Add the amount shown for each extra imprint color, or extra imprint location. We also supply blank (not imprinted) 44" umbrellas at EQP (End Quantity Price). Setup charge: $55.00 per imprint color; $25.00 on re-orders. Estimated Production : 7-10 days after art approval; Rush production is available: 1 Day Service (+25%), 2 Day Service (+20%), 3 Day Service (+15%). 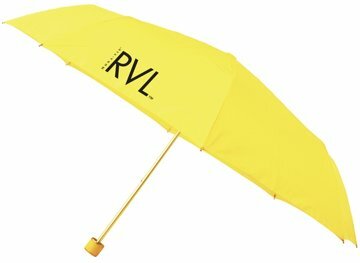 Blank (not custom imprinted) umbrellas ship next day. Matching color nylon sleeve, custom imprinted at extra cost. Colors (assortment is allowed):Orange, Navy Blue, Pink, Yellow, Light Blue, Lime Green, Black. Fiberglass Support Ribs. Velcro Tie Band.